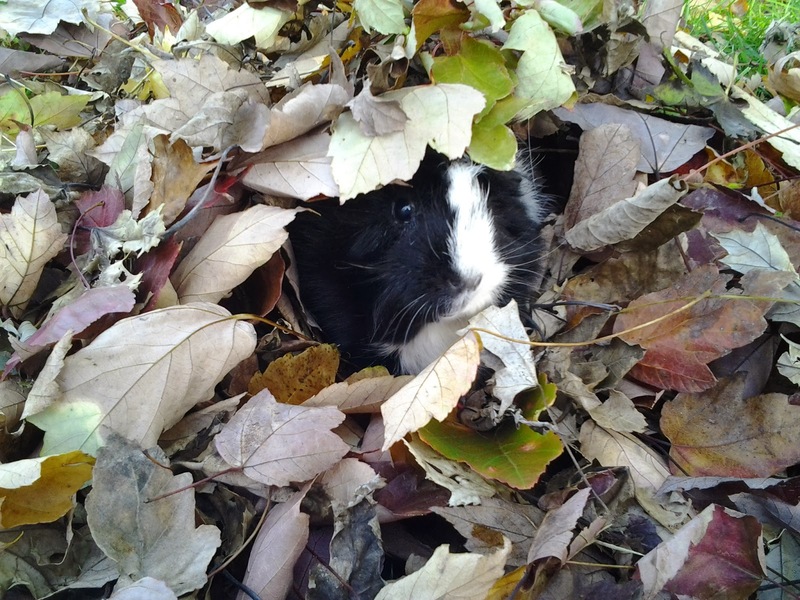 In Oct 2012 , a photo was posted on Facebook of a guinea pig that had been surrendered to our Humane Society. This was a girl piggy who had been a child's pet for 4 yrs and the child had lost interest in her and the mom was tired of taking care of her. 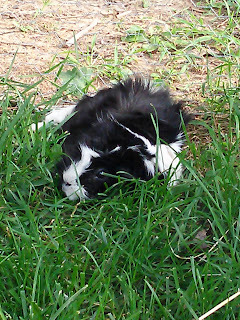 The piggy was scared to death and since our office also houses cats, it didn't make the situation any better. Ma asked dad if she could foster the pig to get her out of the office and help her calm down. He agreed since he didn't think it was a good situation for her neither. What started out as a foster pig , quickly made my pawents a foster failure. Miss Piggy stole their hearts. She hadn't been properly cared for. She was fed low quality food, her nails were curled under from growing so long and she wanted to spend all her time in the house in the cage. This was a sign that she hadn't ever been messed with or socialized often. That all changed. Piggy was brought out of the cage , she got floor time to run around to exercise and she got held ,alot. She adjusted and looked forward to floor time and cuddling. She would lay in the bed with ma and watch tv with us, she would chase us around and she learned to communicate with squee's and wheeks. She became part of our family. 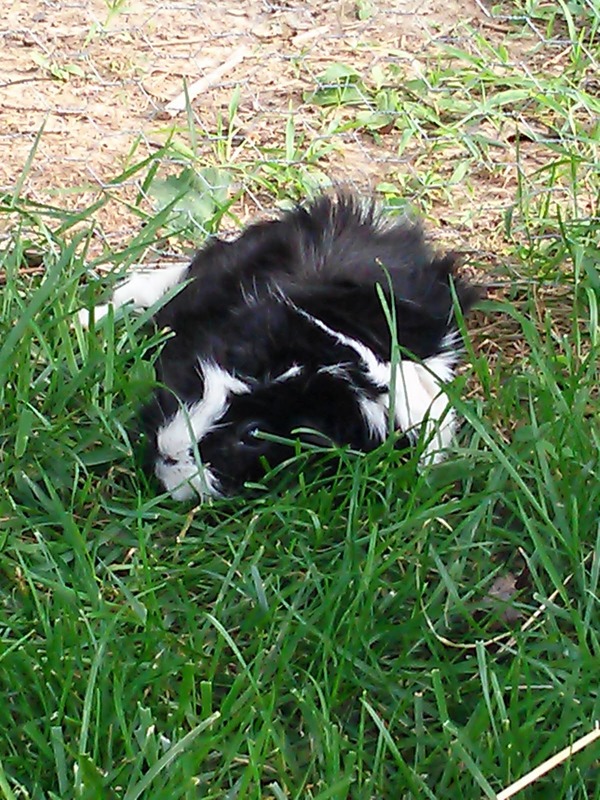 She enjoyed going outside and "mowing" the grass in the summer, stretching out in the dirt and playing on the patio. Her nails were slowly clipped a little shorter each time till the curls were gone and she was able to walk with ease. She loved playing in leaf piles and playing peek a boo. She even liked wearing hats. Ma said she had the sweetest face and we all agree. She learned to give kisses and watching her walk across the floor was sure to bring a smile to your face. She acted as if she enjoyed her life. She ate better quality of foods and loved to be handfed. She got to experience things that was new and if she got scared she would run to ma. 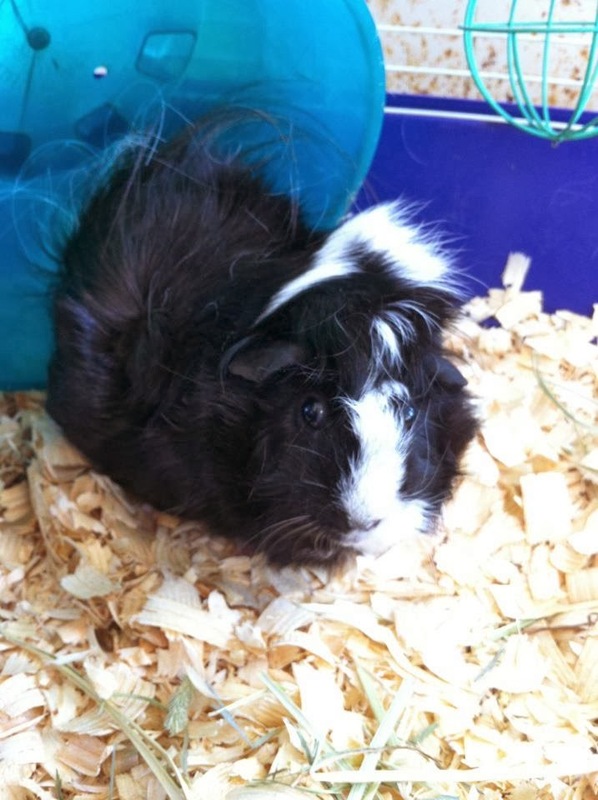 A few months ago another guinea pig was surrendered to the Humane Society. 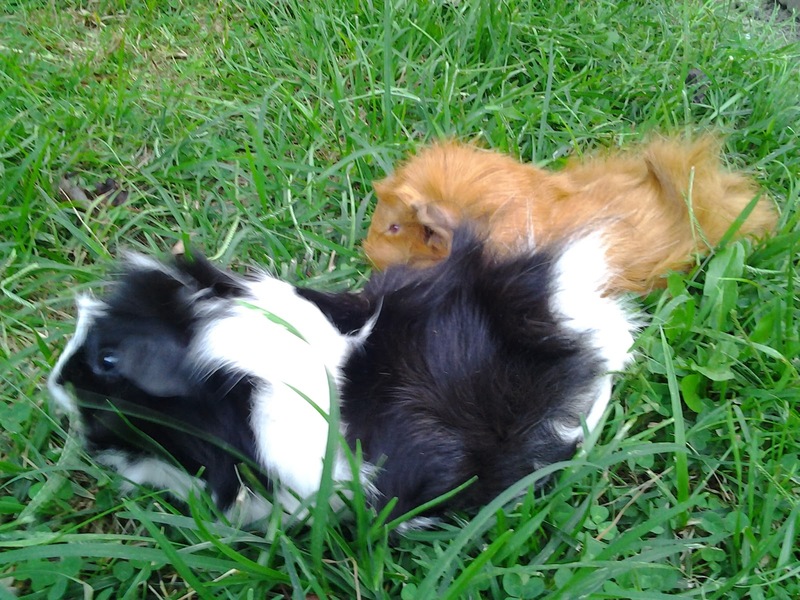 Ma said no more guinea pigs, one was enough. She sent a text to the staff member at the Humane Society saying find another foster and the text back was "ok, we found one". When we got home from the kitty sitting job, there was a second Guinea pig. We named Cinnamon. Dad had seen the photo on Facebook and went straight to the Humane Society to pick him up. He was the "Found Foster". He said Miss Piggy at first didn't like the new guinea pig but he was only a few months old and very tiny, she finally started cleaning him and making sounds that we have never heard before. She was purring. She had a best friend. When Cinnamon reached maturity they had to be separated but the cages sat side by side. They were happy with that. They enjoyed "mowing' the grass together, chasing each other around, taking naps in the sunshine and talking to each other. Piggy's coat got shiny and so did her eyes. She was active and healthy. 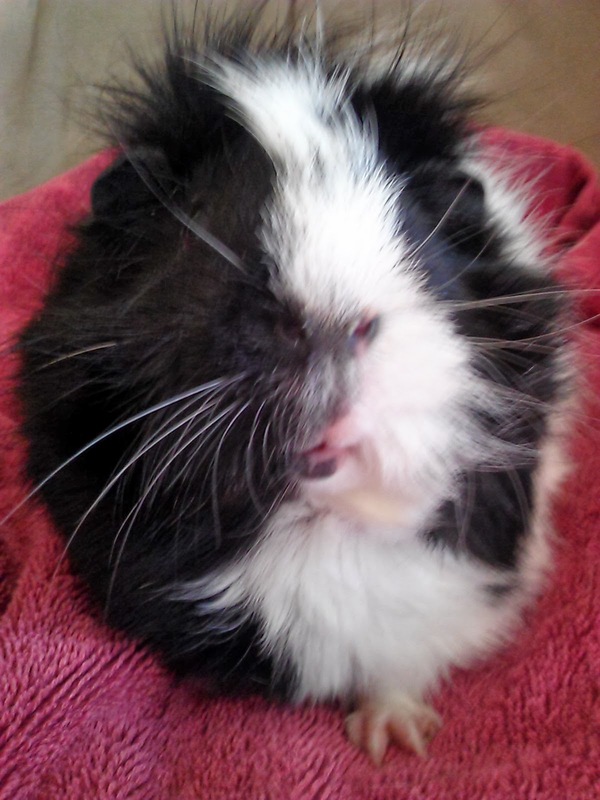 Ma and I have been at our kitty sitting job all week, we came home on Sunday to get Sarah , Scooby and Jenny since dad had to go out of town for his job and the piggies were happy to see ma. They Wheeked and Squeed . She fed them, gave them kisses and we left. 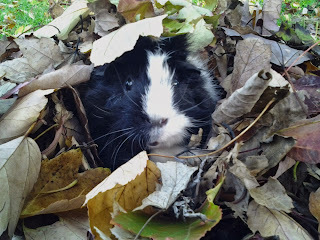 Tuesday we came home around 4 PM and there was no Wheek or squee. She went to the back room where they were and said "can I get a wheek wheek?" No sound was heard. She checked on Cinnamon and he seemed ok but something was wrong. She called Piggy and she didn't come out of her house so ma reached in to wake her up. She looked like she was sleeping. She was cold and had started to stiffen up. Ma threw the house off of her and picked her up but it was useless because she must of died a few hours before. Dad said he fed them hay around 11 AM and she was fine. So sometime between 11-4 she passed away. Of what, we don't know. But she was laying on her side so ma thinks she passed in her sleep. She was buried in the backyard that she loved so much and in her pink blanket that she loved to cuddle in. Piggy was the first piggy the pawents ever had. She stole their heart and mine.We loved her so much. Ma says she wish she would have been here sooner but the ifs, buts and why's aren't going to change things. Cinnamon has sadness, we think he knows. But after cuddling and kisses, he ate his carrot out of ma's hand and enjoyed the time together. We know he is going to miss her. We are. You have brought us much joy. You were the perfect piggy. Please don't listen to the commercials about Guinea Pigs being the perfect child's pet. They take a lot of care, their cages need to be cleaned often and you the parent will be the one who ends up taking care of the Guinea Pig. They need exercise and their nails need clipping. It hurts my heart to see how small some guinea pig cages on the market are. The cage Miss Piggy came in was tiny. She was able to take a few steps to her food bowls and turn around and go back in her house. They need more room than this! 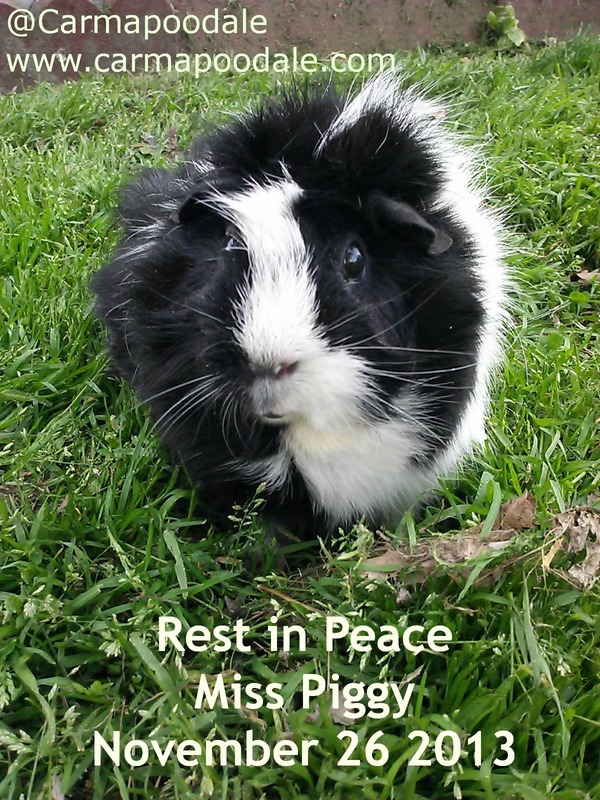 Piggy sounds like she was an absolute sweetheart. I am so very sorry for your heartbreaking loss. I'm so sorry that you lost Miss Piggy, They are such loving pets-when cared for properly and have great homes like yours! Sending hugs to you all and hope that your hearts heal soon. So sorry to hear about Miss Piggy. Thank you for the warning on the bottom - I really hope people read that and realize that any pet is a big responsibility for a child. Miss Piggy is so fortunate to have realized a better life before she passed. We are so sorry for your loss. Take comfort in her passing being peaceful and painless and, obviously, that you gave her the most amazing second chance. Miss Piggy was so very fortunate to have found you. It was meant to be that she had such happiness with you and Cinnamon. Though her life was short, it was happy - one could not ask for more. I am filled with sadness as I type this and hope the good memories with Miss Piggy will sustain you -- sending you a big WOOF! I'm sorry for your loss. Miss Piggy seemed like an awesome friend :( However, I am glad you were able to give her such a lovely life after all the hardship she endured. We are so sorry for your loss. What a wonderful home and life you gave her! She was blessed to be a part of your family, and you were blessed to have her for the time that you did. Sorry for your loss. Thank you for providing a great home for her and showing such compassion and love for her. Oh Carma, I am so sorry for the loss of Miss Piggy. She was so cute! I love her photos, especially the one in the leaves. Sorry for your loss. She looks very happy & content in the pictures. Sue & Boo Check out #54 Chil-laxing! Aww. God bless Piggy. It makes me so sad to hear so many people get pets and then give them away so soon. 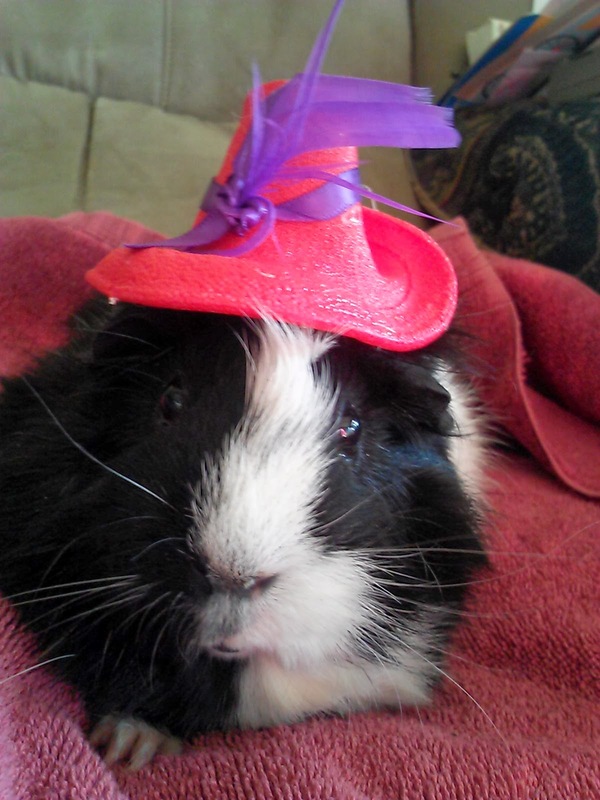 I love the hat on Piggy. My entry is #95. Come by and vote for us? Hugs. Sad that Miss Piggy went OTRB :( I think you gave her the best year of her life.